99 Bottles of beer on the wall 99 bottles of Beer! This is one bar that actually has 99 bottles on their wall. They have 99 beers to choose from off the menu and sometimes 2-3 that are not. I love this place. The beer selection is great, the food is good and the atmosphere is fantastic. While I was in College I went here 1-2 times a week. During that time I went through all 99 choices and got a plaque with my name on their wall. Their trivia nights were also a fun to do as a group. We would go down there as a group and drink beer, throw darts and just have a great time. The bartenders were generally really friendly and give out good recommendations. The service is a mix bag. Usually we got great to fine service. But their were more then a few times we got a waitress or waiter that did a terrible job. Once I even had to complain to the owner since the service was so terrible that night. Overall thought the service is good. Like the previous reviewer said it was only really a few times that the service was bad, but most been good. If you are looking for good beer, large selection and good food then you can't find better then 99 but if you are looking for hard liqueur then you got to go somewhere else cause they only have a beer license here. 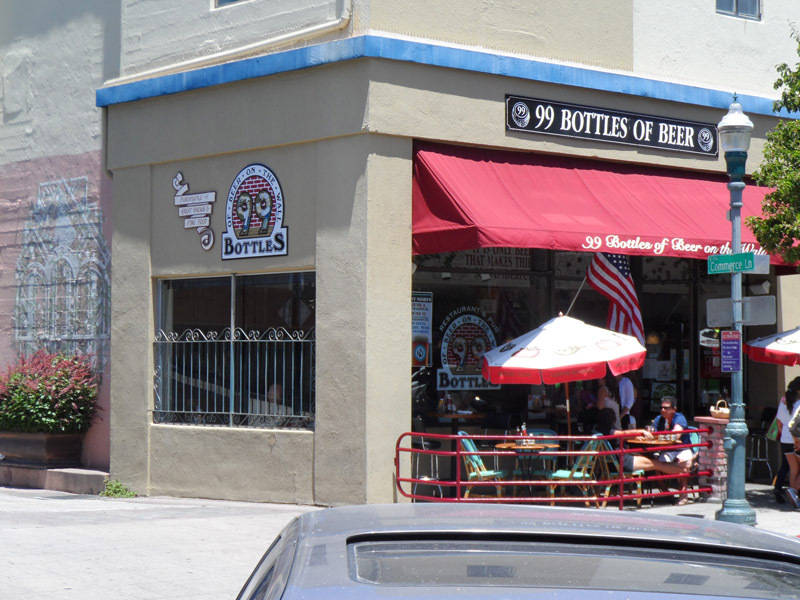 This is by far one of my favorite bars and I make sure everytime I visit Santa Cruz I stop and get a beer at 99 bottles. This is my all-time favorite beer bar. They have 99 different beers, some of which they rotate every week so even if you've made their Wall-of-Fame (by drinking all 99 beers), you can still find beers on the menu that you have never tried. The bar tenders give great recommendations, and the owner is incredibly friendly. You can sometimes find him wandering around chatting with anyone and everyone making sure they're enjoying themselves. It is a Brittish style pub, with standard pub-fare. The food is really good by bar standards, and you'll usually find it very busy during dinner hours. The fish and chips are good, and the English style burgers (with great big slabs of bacon) are fantastic. They also have events almost every day of the week during the evening hours, with their Trivia Wednesdays (or was it Tuesdays?) being the most popular (you have to get a table very early because they fill up to capacity quickly). They have 40+ beers on tap and the rest are bottled. Their fantastic selection ranges from local brewery favorites to imported Trappist Belgians. Just about any great tasting beer you can think of has been on their menu at one time or another. I've found so many new favorites at this place, I couldn't even keep track of them all. The service is usually good, though every once in a while you'll get a waitress that doesn't come by to refill your beer orders, water, or just plain doesn't come by to do more than take your initial order and drop off the food or beer. Normally I like to give them the benefit of the doubt, but I've been there at least 30-40 times and I'd say 1 in 4 we get poor table service. If you aren't there for food, just pull up a seat at the bar and you'll get great service. They do have a dart board upstairs, but you'll only be able to use it when they aren't too busy since they have seating right beneath it. Over-all the look, feel, and atmosphere of 99 Bottles is fantastic. Any beer lover would do well to stop by if they ever find themselves in Santa Cruz.